2. 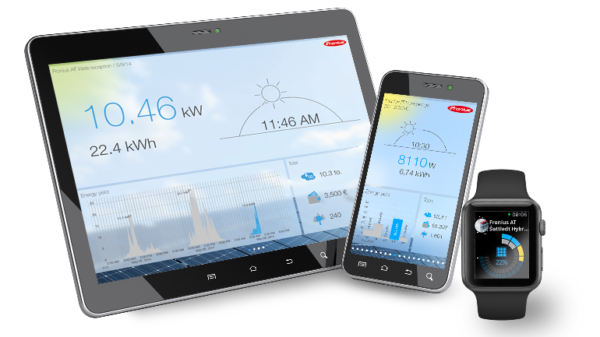 Scroll down and download the Fronius Solar.web Live App from your appropriate app store. 3. Once you have downloaded the app, open it, and press the red icon on the bottom right of your screen. 4. Click Set Up My Fronius Inverter. 5. Select the top option called Grid-Connected Inverter. 6. Go to your home’s inverter. 7. Open the inverter’s menu by pressing the third button from the left. 8. Scroll across to Set-Up, and press enter. 9. Scroll down to WiFi Access Point, and press enter. 10. Select Activate WiFi AP. 11. You’ll see the default WiFi password is 12345678. 14. Once your smart device is connected to your inverter’s access point, return to the Solar.web Live App. 15. Click Solar.web Wizard, and enter in the required details. 16. If you’re in Victoria, your feed-in tariff is $0.113 (11.3 cents). 17. Set the grid supply tariff, which can be found on a recent electricity bill. 18. Enter the time, day, and time zone, and then hit Forward. 19. Give your system a name. 20. Enter the PV power in Watts. If you have a 5kW system, type in 5,000. 21. Press Forward, then press Accept on the pop-up notification. 22. Select your home’s WiFi from the list, press Set, then enter your home’s WiFi password. 24. You’ll now need to exit the app, go to your WiFi settings, and connect to your home WiFi network. 25. Return to the Fronius Solar.web Live App, and wait for the network connection. Please note this step may take a few minutes, so please don’t be worried if it does not load immediately. 26. Once you reach the next screen, click Forward. 27. Set a password for your system. 28. Once you’ve entered the password in both boxes, press Finish. 29. When you’re finished, the app will take you to www.solarweb.com to create a Solar.web account. 30. Click Register, populate all the required fields, then click Next. 31. Make sure you make a note of your Solar.web password, as this will be required soon. 32. The next screen will show details of your solar PV system. You should not have to do anything except click Submit on the bottom right. 33. Solar.web will then send you an email with a confirmation link. 34. Once you’ve received the email, click on the confirmation link. 35. Return to the Fronius Solar.web Live App, click on the icon on the bottom right, and click Log In To Solar.web. 36. Enter your Solar.web email and password, and click Log In. 37. You’re finished! Your online monitoring is now set up.